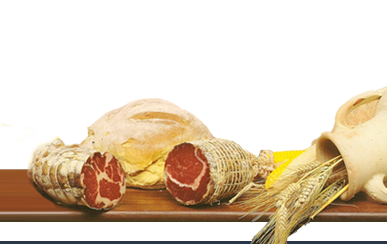 At the origin of our story Dino Mancinelli, a young hard worker living in the countryside, used to participate, year by year, in the awaited winter rite called “pista”, when country folks of Marche, kill pigs for making various kinds of cold meats and salami. 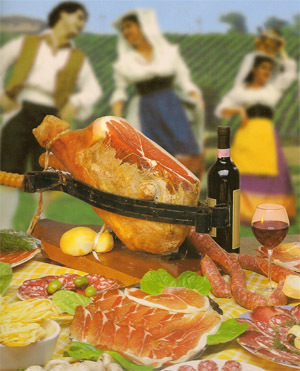 Our young man, actively participating in this particular procedure, learned from farmers basic techniques to obtain, with firm and tasty swine meat, sweet-smelling and genuine hams, loins of pork and salami. He rapidly became a really good pork-butcher. In 1955, a period in which many people in Italy had to draw their future, Dino decided to turn his knowledge into a real job. 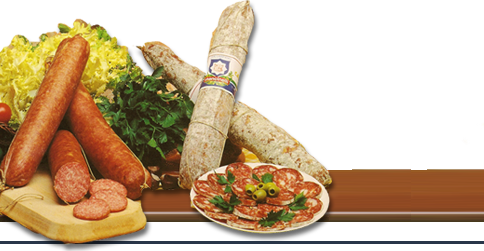 He opened a grocery in Falconara Marittima, where he could sell his own kinds of cold meats, salami and sausages. His customers really liked his products. He had a great success and other groceries wanted to be supplied. This was the starting point of a craftmade activity: a factory producing cold meats and salami. In 1967, Dino had to move his business to a biggest place, in order to activate a massive production; the new plant was settled on a nice hill at the outskirts of Falconara, the name of the street, Via del Tesoro (Treasure Street), seemed to be of good omen and representative of the good production quality too. Today, everyone, in this area, knows Mancinelli and his “treasures”. So, how to maintain and, if possible, ameliorate his image? In 1981, Dino and his children, who turned to be indispensable cooperators in managing the company, decided to support the factory with a pig-breeding farm, in order to grant a high level of quality throughout the entire productive chain. By the early nineties, the veteran owner and his three sons became the four leading characters of the factory; the company from a one-man business turned to a corporation with a consequent enlarging of premises and plant modernization, so as to better correspond to the latest European market needs. Today, after many years since 1955, if you come and visit us at our company, you would occasionally meet Mr Dino who still loves to live close to what he gave birth to and what he has seen growing up; you would certainly find his sons continuing manufacturing with perseverance and pride, as in the family tradition, because they do not want to lose that folk wisdom heritage and that craftsmanlike capability you can still find in their products.